Happy Monday everyone! Unfortunately, I'm busy with school stuff, but because I'm putting off reading for class, I figured that I'd take a quick break to post this recipe. I was surprised with how well this recipe turned out. If someone bottled up sunshine and a little bit of the beach, this is how it would taste. Even though it's more of a summer smoothie, I'm sure that it will transport all of you who are stuck in the cold to a day at the beach, even if only for a brief moment. 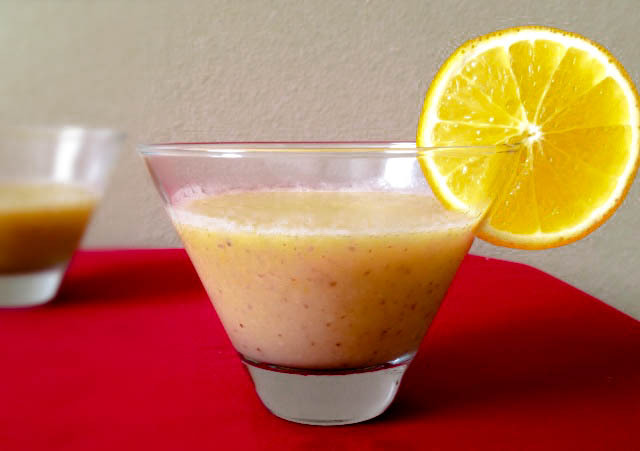 For those of us enjoying the sun and sand, consider these smoothies another perk. I guess what I'm trying to say is that, no matter where you are, one of these smoothies will surely brighten your Monday. Total Cook Time: 5 minutes. Add the banana, mangoes, and the ground flax to your blender or food processor. Pour in about half of the water. Process for a minute or so, adding water as necessary to achieve desired consistency. Garnish with orange or pineapple slices.